Ferment Fortnight returns to its rightful Studio home this January! Here, Ryan O'Shea gives us an inside look at his upcoming sharingI R A N. Catch it Wed 30 Jan.
My name is Ryan O’Shea and I make solo theatre pieces but also work with Anglo-Belgian theatre collective Reckless Sleepers, Michael Pinchbeck and Bristol Ferment Favourites Massive Owl. I really love physical, contemporary work that is often abstract and surreal but rooted with context and layers. What are you presenting at Ferment Fortnight? 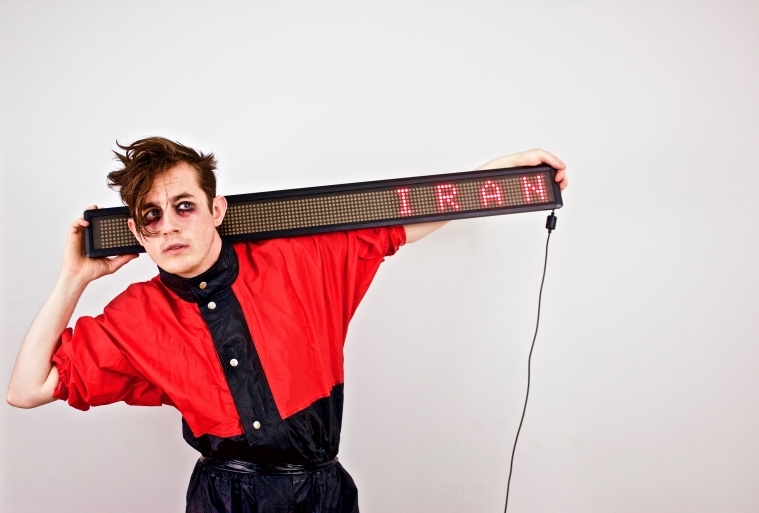 I’m presenting show at Ferment called I R A N. I’ve taken the narrative and stylings of the song ‘I Ran (So Far Away)’ by 80s new wave, synth band A Flock of Seagulls and then used a treadmill and a scrolling LED text bar to tell that narrative. At its heart, it’s about a human desire to run away when confronted with large levels of emotion. It’s just me, the treadmill and scrolling text bar with no speech but an awful lot of running! I am always inspired by objects when making theatre, in this case the scrolling LED text bar came first. I really like watching theatre with subtitles that disconnects voice from action and lets audiences fill in the blanks. I saw an LED bar in a shop window and thought, that’ll be great to use in a show as it could act like subtitles but I could also pick up the bar in my hands and physically interact with the text. The scrolling nature of the text and the relentless scrolling motion of a treadmill became a natural fit to experiment with. I remember listening to the radio while driving, the song “I Ran” by A Flock of Seagulls came on and it was the most perfect fit for what I was trying to explore. The more I looked into the song, the more captivated I was; it’s a great tune and their whole debut album is also really great, go check it out. The band plays with narrative in an inventive, unusual way and they put universal human emotion against a backdrop of an alien invasion; it’s weird but I love it. So, I’ve used these objects and the song to build the show I R A N.
What does the work that Ferment do mean to you? The work at Ferment is really inspiring and necessary. As an emerging artist, having a platform that is supported by the Bristol Old Vic is amazing and vital for the future development of artists. I always go along and see the Ferment Fortnight shows when I can as they always offer something different and unknown, so it means a lot to be part of the programme. I really can’t wait to show I R A N to Bristol and to see the other exciting work in the programme too! What would you say the audience can expect in three words? Ferment Fortnight commences at Bristol Old Vic 22 Jan - 2 Feb. For more info and to book tickets, click here.